CWE Store Fixtures are a supplier of new & used shelving and racking, whether it is for a retail store, backroom storage, warehouse, shop or office facility. 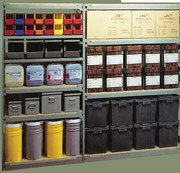 Shelving is available in light-duty, medium-duty or heavy-duty units in standard sizes and configurations. Nut & Bolt (Dexion Slotted Angle), Easy-Up/EZ-Rect Boltless shelving, Metalware Steel shelving, Pallet Racking and Wire shelving are a few of your choices. For more shelving solutions please use the link provided below.